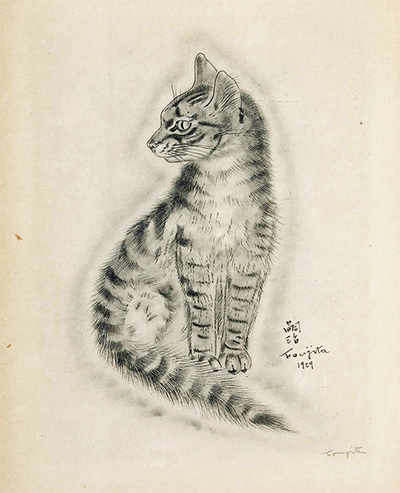 A copy of Michael Joseph's Book of Cats, published in New York by Covici Friede, 1930, with drawings by Tsuguharu Foujita (1886-1968), is being offered by Bonham's in its Fine Books and Manuscripts sale on Monday, February 10, 2014, in Los Angeles as lot 103, It is estimated to sell for $60,000 - $80,000. 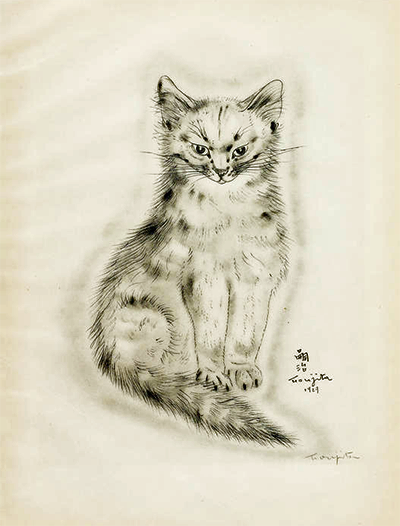 The book, comprised of twenty prose poems by Joseph with twenty accompanying full-page etched plate drawings by Foujita is here in its limited edition of 500 copies, this being copy no. 333. 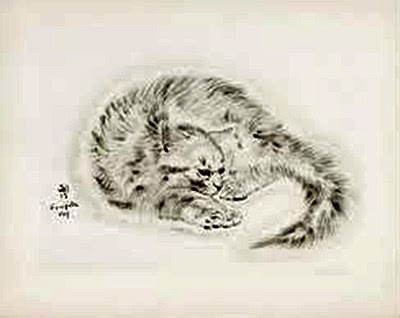 It is signed by Foujita on the limitation page and features a plate signed by Foujita, Semiramis. This copy includes an additional suite of the plates on Japanese vellum with fragments of the original envelope they were housed in. 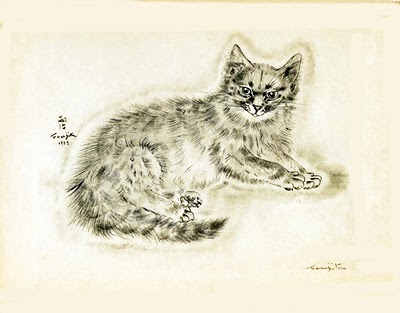 Tsuguharu Foujita was the most important Japanese artist working in the West during the 20th century. 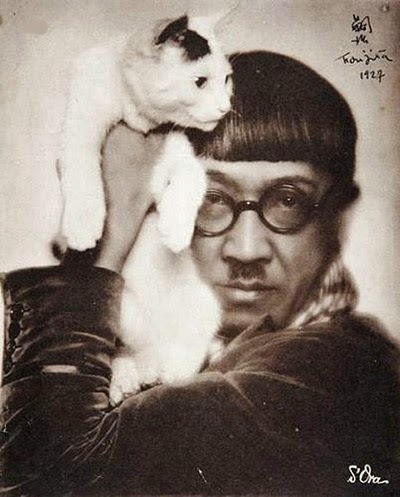 Foujita by Madame D'Ora, 1927. "He arrived in Paris from Tokyo in 1913 and soon rented a studio in the Cité Falguière, where Modigliani and the Lithuanian-born painter Chaim Soutine were working. Foujita was a good cook; he was meticulously clean - he tried to teach Soutine to brush his teeth and to use a knife and a fork. 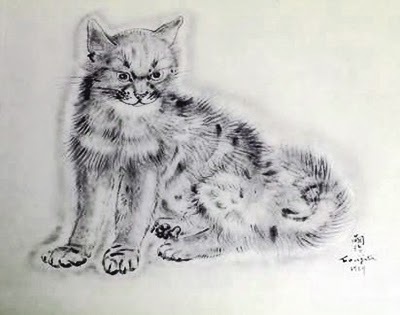 Foujita had frequented Isadora and Raymond Duncan's school of movement and dance (hence the Greek-style tunics). He'd favored the Café La Rotonde, where Trotsky used to play chess, over the Dôme, the favorite haunt of the Fauvists" (Durden-Smith. Lost Art, Departures, July/August 1999). He and Modigliani hung out together. He was pals with Leger, Gris, Braque, and Matisse, By 1918 he was the most famous artist in Paris, at his peak more successful than Picasso, another good friend. When he installed a bathtub with hot running water in his studio he became everybody's best friend; female models flocked to his studio. Alice Ernestine Prin, aka Kiki, when not posing for him was a fixture in his tub. He was the cleanest man in town and the toast of Montparnasse. In 1925 he won France's Legion de Honneur and the Belgian Order of Leopold I. 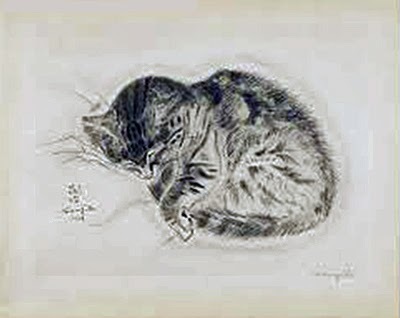 In 1926, the French state bought its first Foujita. Not quite twenty-five years later, France bought its first Picasso. He was married three times. 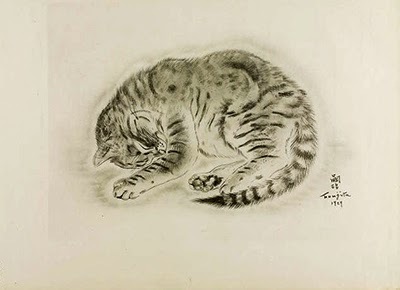 Foujita's artwork at auction has reflected his strength and reputation, with prices in the low-four to mid-five figures for drawings, and upwards of $400,000 for paintings. Prices for the Book of Cats in its original limited edition have been very healthy. This is a book that appears to be recession-proof, with art collectors and cat fanciers vying for precious few copies in collectible condition. Without the extra suite of plates auction prices have lately ranged from $25,000 - $30,000. Within the last few years copies with the additional suite have sold for $42,000 - $60,000. This is a book that will never lose its value as long as cat people with a bankful o' kibble desire it. This volume is certainly the most popular and desirable book on cats ever published. UPDATE 2/11/2014: Sold for $77,500 incl. premium. 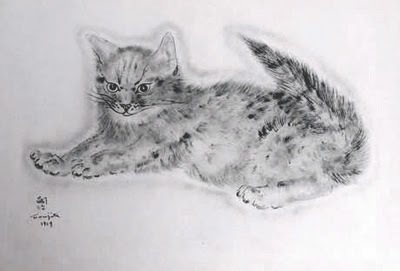 Foujita cat images courtesy of Bonham's, with our thanks. Some images may appear here in different tone than in the copy offered. This is lovely! What beautiful work.